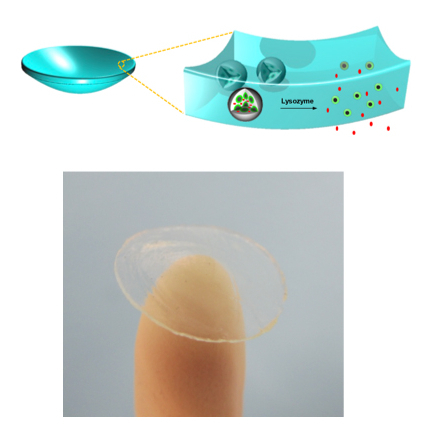 In what could be a significant step toward improving the management of glaucoma, an eye condition that can eventually lead to blindness, a team from the UCLA School of Dentistry has created nanodiamond-embedded contact lenses that can act as a drug delivery system with less severe side effects than traditional medication. The new technology, described in a paper published at the peer-reviewed journal ACS Nano, releases glaucoma-fighting drugs injected into the tiny diamonds, working as soon as they interact with the patient's tears. According to the scientists involved in its creation, the method shows great promise for sustained glaucoma treatment and, as a side benefit, the nanodiamond-drug compound extends the contact lenses' durability. Delivering timolol through exposure to tears may prevent premature drug release when the contact lenses are in storage and may serve as a smarter route toward drug delivery from a contact lens," said Kangyi Zhang, leading co-author of the study. Nanodiamonds, also known as detonation nanodiamond (DND) or ultradispersed diamond (UDD), have excellent mechanical and optical properties, high surface areas and tuneable surface structures. They are also non-toxic, which makes them well suited to biomedical applications.